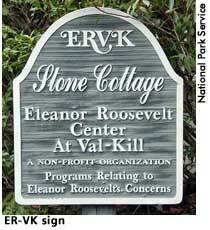 The Eleanor Roosevelt Center at Val-Kill (ERVK) is a nonprofit organization that grew out of efforts in the mid-1970s to preserve Eleanor Roosevelt's home at Val-Kill as a historic site. In 1977, President Carter signed a bill that allowed ERVK to partner with the National Park Service to use the Eleanor Roosevelt National Historic Site for educational programs tied to ER's legacy. Housed in Stone Cottage on the Val-Kill property, ERVK introduces ER's life and legacy through a variety of programs: a lecture series on issues to which ER dedicated her life, the Girls Leadership Workshop, community monitoring of welfare reform policy, and other initiatives. ERVK also confers the Eleanor Roosevelt Val-Kill medal on people whose commitment to social justice reflects ER's courage and dedication.